Fun caricature photo gift ideas created by John are totally unique, personalized and fun. Just send one or more clear photos and describe ANY scene and your dream will become a reality. 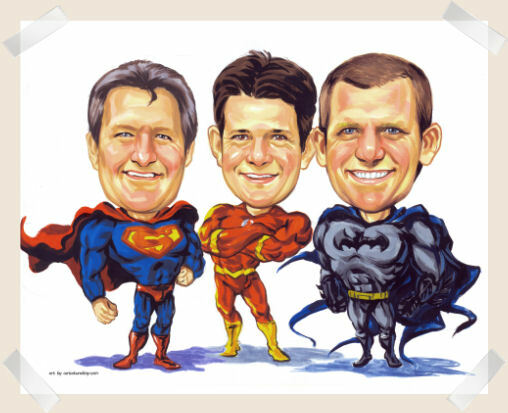 Caricatures make perfect gifts for many gift occasions. Have a pet? John draws pets as well! Every fun caricature is drawn to your directions! Custom drawn, one-of-a-kind? You betcha!! John is the expert artist for your exclusive fun caricature from photo gift. QUESTIONS? Use our contact form at the bottom of this page for a fast response! Fun caricature from photo – the perfect gift choice! Skilled in the artistic techniques of drawing a caricature from photos and using your ideas to create a fun gift, artist John creates life-like caricatures with a humorous slant that are a perfect gift for many occasions. No matter if it is a child’s 18th or 21st birthday gift, a spouse or friend’s 40th 50th or 60th birthday, your wedding anniversary, save the date for a wedding, retirement gift, new baby and more! Your idea will be turned from a unique gift idea into reality. 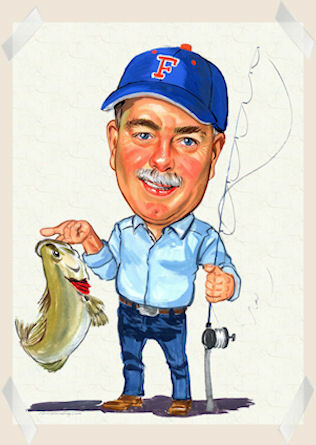 People are overjoyed at receiving a fun caricature as a gift for many occasions including: birthday, retirement, teams, and bucks gifts, made to put on t-shirts for road-trips, family holidays or any group activity. It is because people like to see themselves just that bit differently. The photos supplied are important as this is what is used to reference the person. When drawing a caricature from photo, the subject with an expression that is whacky or zany allows more flexibility in creating a fun artwork that is cherished by the recipient. An expressionless photo is hard to work into an image that has fun and humor, though if the person is deadpan in life, then maybe a photo lacking bug emotion is the right one! Also when drawing caricatures from photos, all John can go on is what he sees in the best photo.